You need to perform additional configuration to run your application in Android. The AndroidManifest.xml has to include the following line. In order to render the entities of the virtual scene in a real-world environment, the ARCameraRig component should be used. 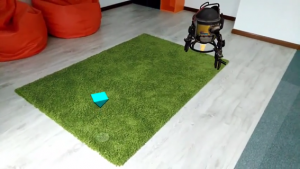 This component is generic for all AR implementations available in Wave Engine and is responsible to adjust the camera entity properties to the device’s physical camera. The light estimation feature can be easily included in the scene with the ARLightEstimation component. This component must be added to a light entity and it will modify the light properties according to the information provided by ARCore and ARKit. The HitTest method available in the ARMobileProvider component performs a ray cast from the user’s device in the direction of the given location in the camera view. Intersections with the detected scene surface are returned, sorted by distance from the device; the nearest intersection is returned first. The ARMobilePlaneVisualizer component can be used to visualize detected surfaces. Using the property PrefabPath, a prefab entity can be chosen to represent each plane.